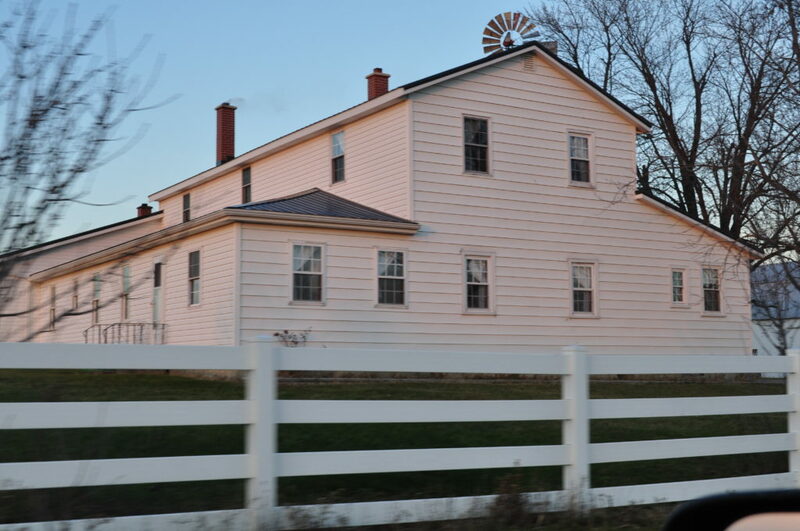 I was exploring the Amish areas outside of Berne, Indiana before Christmas when I discovered a combination Amish bakery/gift shop tucked away on a rural road. 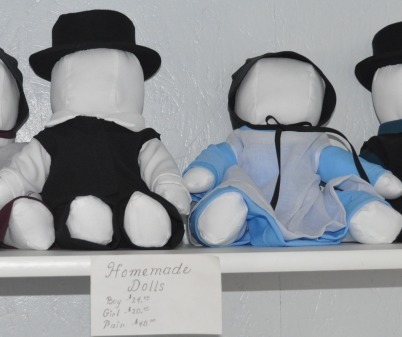 While visiting I spied some beautiful hand-made Amish dolls which the owner made herself. She was selling several of them and with Christmas just a whisker away I thought Aster would adore one. Or at least I would adore the thought of Aster adoring one. The price-tag was $20 and I didn’t have $20 on me. I told the woman that I’d run into town to the ATM to get $20, but she was insistent that I just go on home and send the money to her at my convenience. “No, no, don’t worry about it, just send it when you can.” she said. So I did. I didn’t wait six months, I sent it to her the next day, relieved when I put the money into an envelope and sent it on its way. But this time of honor system is common among the Amish: at produce stands, at stores. It’s unnerving because it’s so rare in today’s world, but hopefully most people reciprocate the honor system with their own and pay it forward. Now, back to Aster and the doll, she enjoys it, but I think she likes choo-choos and blocks and toys with a bit more action right now. 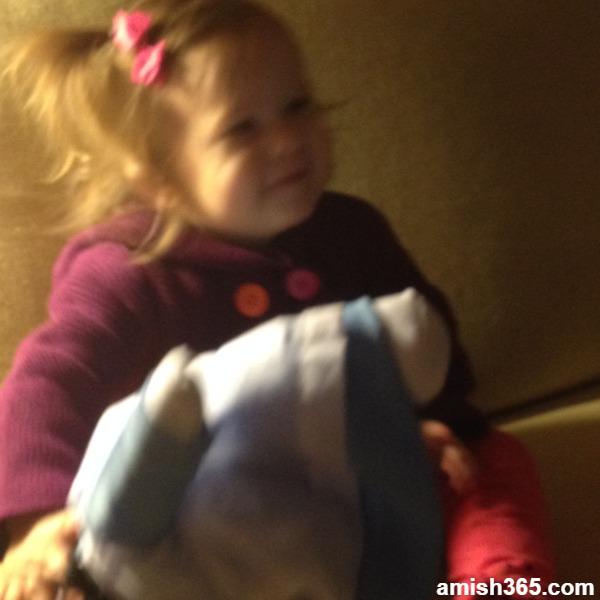 Still, it’ll be a nice keepsake and when she gets older I know of some other Amish-made toys that are on my list! Here is a photo Aster and the doll…SIGH, blurry…I was trying to get it fast before Aster scampered away…getting any 15-month old to sit still for a photo is a challenge. 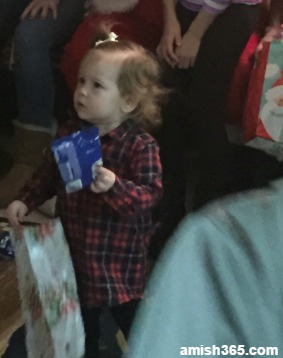 Aster had a nice Christmas, hard to believe A) she is now over 15 months old and B) we are already to January 9. Time is a speeding freight train. 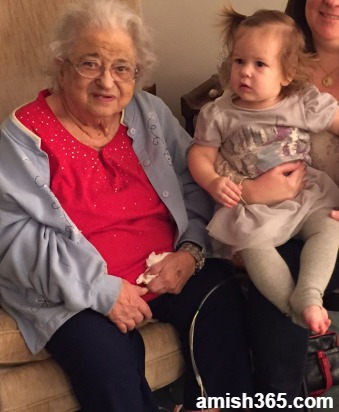 Here are a few other photos from Christmas, Aster with my soon-to-be-90-year-old grandmother and Aster at a family Christmas party. Aster is adorable. Hold on to these times. It goes faster and faster as they get older. Ella’s going to be 9 on the first of Feb. I have no idea where that time has gone. There used to be a bulk food company in Holmes county that had a catalog. The figuring postage was tricky as you had to combine all the weights, sort of like the old Sears catalog. They had a notation that if you couldn’t figure the postage, just send a blank signed check and they would fill it in and send you a receipt, so I guess the trusting worked both ways 🙂 . Thank you for posting the pictures of Aster she is a little doll. I enjoy all your posts and pictures. Most of all I enjoy hearing about you and your family. Enjoy your weekend with your family. it is always great to hear about your family and that you share pix is appreciated. time does fly faster and faster. I so vividly recall our first granddaughter cutting her first tooth while I was being a nanny/Nana for 3 wks and now she is about to get her drivers license. when I asked her sister who is Trisomy 21 and 4 yrs younger how her sisters driving is going she answered She thinks she is a good driver, yep. This is as close to a negative remark as she has ever gotten about her older sister. She so loves her and feelings are very mutual. Thanks for the pix of Aster. She is really growing. It seems just yesterday that I first became a Gramma, but that young man is thirty yrs. old now. YIKES!!!! Ten grandchildren later, I still enjoy each and everyone of them. I also have five great grandchildren makes me feel old. Thanks again for sharing our little Aster. Thank you for the kind comment, Carolyn! Thank you for adding those precious pictures of Aster. We love watching her grow. Please ignore any naysayers on this subject. Good luck figuring out your email. Thanks for posting the nice pictures of Aster and your family. Love to hear about your family and Aster. Yes time does go by fast. My children are grown, and have children, their children are grown and have children. Have a 18 year old grandson who lives with family in Wyoming. Husband and I live in MI. So enjoy and love Aster. Thanks, Helen, yes I don’t Aster to someday move away, I’ve put too much into her already to see her one day fly away! Aster gets cuter by the day! My youngest hooligan…I mean grand son is 2 and a half…and if he lives to see 3 it will be a miracle. Look up the word hooligan and you’ll see his picture. My oldest granddaughter is preparing for college in the fall. Now, I want to know how that happened! Wasn’t she born yesterday? 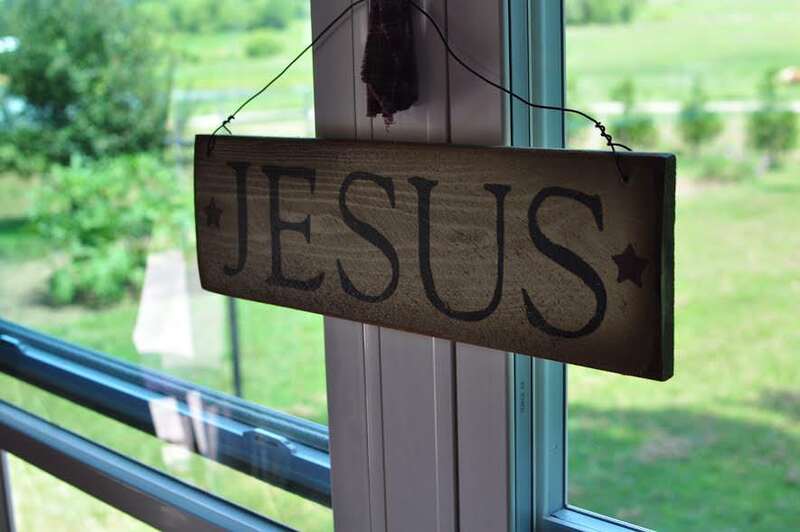 Thank you,, Heather….a granddaughter preparing for college!! Wow! Kevin, Aster is very sweet and the picture with her great-grandmother was touching. Keep plugging away and all will come together. Gloria and Rosanna are gifted writers. 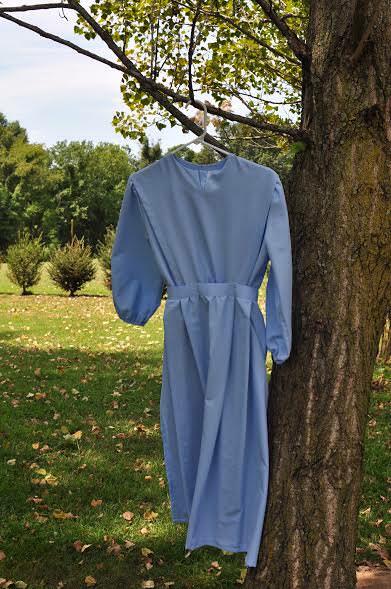 Would you share why Lovina is no longer The Amish Cook? Were there serious health issues or something else? She was like a member of the family and I looked forward to reading about her family, especially, whether Elizabeth and Susan are engaged. Thanks and keep up the good work. Thanks so much for your articles. 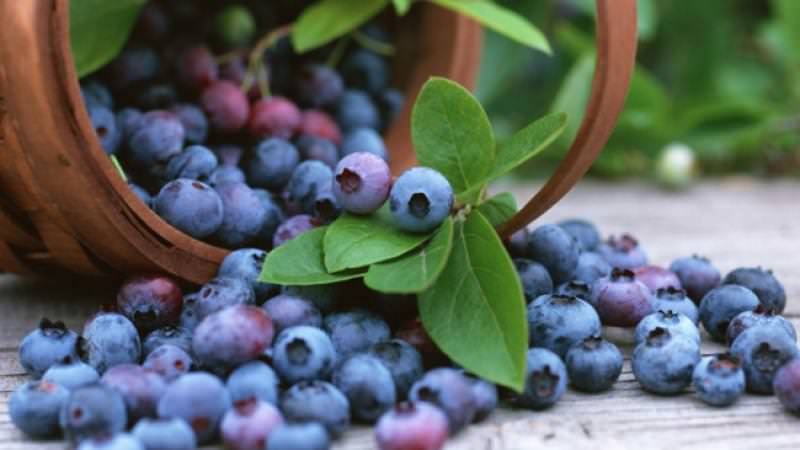 I especially like hearing about the stores you visit and hope to get to some this summer. I live near Dayton, VA and we have a large Amish community and when we moved here the horse and buggies were so nice to see. My daughter was just a baby and we gave her the plain dolls for her first Christmas and I still have them. I framed them in a picture frame and hung them on her wall. Keep sending pictures of Aster and family because to me that is what your column is about-families! Aster is such a cutie pie!! I love the pic with her little feet crossed. Pudgy toddler feet and hands are too cute!! LOL, cute on a toddler yes, an adult, not so much!